NTT Inc. - Infrared Thermography: How Will Your Employees Work With It? Most equipment failures signal that there’s a problem ahead long before the failure occurs. 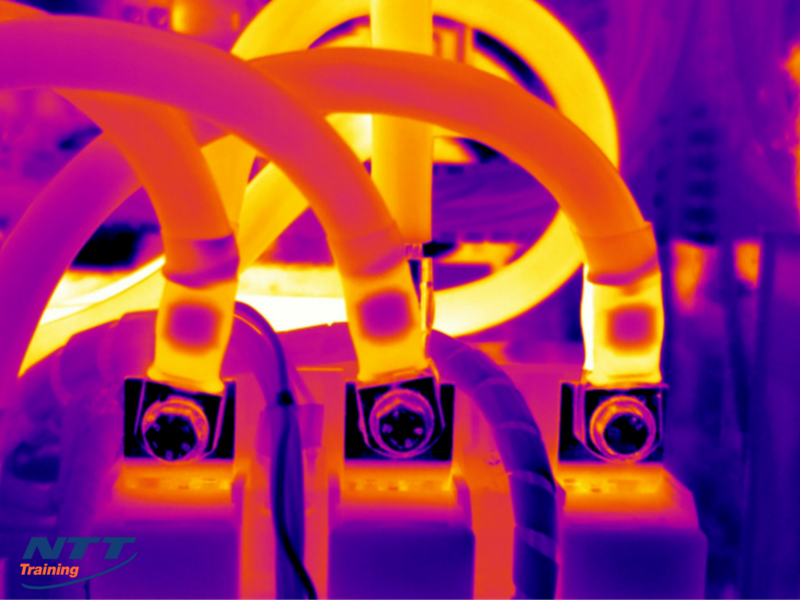 Infrared thermography, which uses infrared wave-length light not visible to the naked eye to detect heat patterns, helps identify faulty components so they can be fixed before they cause total failure of a piece of equipment, and possibly more extensive damage down the line. Infrared cameras allow the capture of the heat pattern of a piece of equipment without the need to touch the equipment, creating a safer environment for the operator, known as the thermal imager. From a safe distance the thermal imager can observe any anomalies of temperature under regular operating conditions. Operators can avoid exposure in extremely hot conditions. They can also avoid dangerous conditions that include moving parts, difficult-to-reach components, equipment that can’t be shut off, or equipment that could be contaminated through touch. The cameras can also be used to detect areas of energy loss, so that buildings and homes may be made more energy-efficient. Further, thermal imaging cameras can be used to detect energy- or moisture-related issues within a building, such as the presence of leaks, which might lead to structural damage. Thermographic images detect variations in temperature, with cooler areas representing the site where heat is being lost, and therefore a need for adding insulation or weather stripping. Thermography can play an important role in warehouse management, particularly where highly flammable or combustible materials are stored, providing an early warning system for hot spots. Thermal imaging has an advantage over typical security cameras in that it does not require lights to be on. A new way to use thermal imagery is evolving with the increasing presence of drones. Thermal imagery cameras mounted on drones can be used in many ways for construction, as well as for agriculture, search and rescue, fire fighting, solar panel inspection, power grid inspection, and real estate. Apps for thermal imaging have also been developed, including models for use with high-resolution night vision and thermal cameras that fit in a hand, and from which images can be transmitted instantly. To make the most of infrared scanning, the thermal imager must be able to gather and interpret data correctly. While apprenticing to someone skilled in infrared thermography can be one way to obtain the training, a workshop or seminar conducted by a top professional can be an efficient way to ensure employees are well and consistently trained, and able to provide good images and interpret data accurately. If you are an employer in the building trades or any of the professions mentioned above that use thermal imagery, you may want to arrange to have a training on your work site for employees. Why not check out NTT Training’s Infrared Thermography to train your team in this valuable skill? Connect with NTT Training today for more information.